The very basis of carrying forward the Ayurvedic essence which is indicative of cleansing, improving and benefitting our mind, body and soul is the Ayurveda stipulated treatments, remedies and therapies. Therefore, we at Ayuryogashram offer a comprehensive set of Ayurvedic treatments and therapies that are determined as per your need, ailments and body compositions. As a result, most of our treatments and therapies are packaged individually and customized accordingly. In addition to the standard treatment options, we do offer specialized packages that are aimed at back problems, obesity and weight-loss, rejuvenation, relaxation and stress management, body purification therapy, body immunization, anti-ageing and longevity therapy, and skin, hair and beauty care therapies. 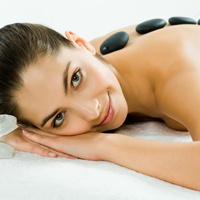 The word ‘Abhayanga’ indicates massage. Therefore, this popular medicated oil massage therapy is aimed at improved body circulation, rejuvenation, improved muscle and tissue strength, trimming down cellulite and weight loss, relieves stress, improved skin tones, eliminates toxins, reduces aches and pains, induces better sleep and promotes better energy. The‘dhara’ series of massages are predominantly focused on the head. Collectively speaking, the basic derivative from these massages is to help relax and revitalize our mind and nervous system. In addition, this therapy is excellent to treat insomnia, hair loss, some mental diseases like depression and anxiety, de-stressor, memory loss and some skin complaints. In Thakradhara, after a good head massage, medicated buttermilk that is infused with herbs is poured slowly, steadily and in an uninterrupted flow from a vessel placed over the head and is aimed directly at the forehead and scalp. 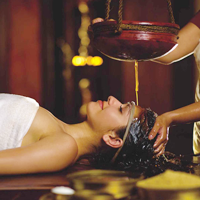 In Shirodhara, following a head massage, it follows the same pattern as the thakradhara excepting that medicated herbal oil is used in place of buttermilk. Plant leaves and medicinal herb powders are sautéed in medicated oil and applied all over the body in a systematic, rhythmic massage for a specific duration. This is also referred to as Elakizhi or Pachakizhi and the treatment fomentation process includes using herbs, boluses and medicated oils. The treatment duration is for a period of at least 7 days and it helps relieve certain arthritic conditions, frozen shoulder, sciatica, cervical spondylosis and pain and stiffness in the joints. In the Shirovasti treatment, tepid medicated, herbal oil is poured gently on the head anywhere between 15 minutes to an hour, as per the requirement and for the treatment period lasts anywhere from one week to a fortnight. In this treatment, a kneaded dough band is placed around the head to contain the oil and it is left for a prescribed time so as to take effect. This treatment helps cure cervical problems, sleeplessness, migraines and other problems relating to the head, hair loss and ringing in the ears. Kati Vasti treatment ensures lower back pain relief by using warm medicated oils and herbal pastes in the lower back area. The herbal paste encases the oils and is left for a specific duration ad this definitely helps alleviate backaches, sciatica and prolapsed disc problems. In the Pichu method of treatment, cotton sponges dipped in special medicated oils are used to sponge a person from head to toe, and this is effective in treating a nervous breakdown, rheumatism, paralysis, insomnia, hypertension, headaches and back pains and migraines. This is relatively a dry massage, wherein herbal powders are massaged on to the body.Udwarthanam is proven effective especially for weight loss, to tackle obesity, reduce cellulite, tone skin and muscle and thus tighten loose skin and help generate better complexion. This treatment does help remove unwanted fat deposits in the body. The treatment time and duration is specified individually. 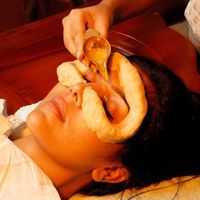 The Tharpanam treatment is aimed at improving the health of the eyes, reduce strain and thus improve eyesight and the blood circulation to the eyes. Medicated Ghee is poured into an herbal paste and placed on the eyes for anywhere between 15-30 minutes a day. ‘Soundarya’, means beautiful and ‘Vardhanam’ means enhancing and that is what the herbal facial sets out to achieve. 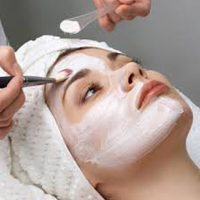 In an herbal facial, certain specially made herbal powders, pastes, lotions and packs are used as part of the facial. The overall benefits of improved and glowing skin tones, rejuvenated skin, reducing pimples, wrinkles and freckles and also any marks and reducing of black circles are achieved. Little drops of medicated oil are gently and gradually administered in each nostril as part of the Nasyam treatment. This treatment helps eliminate toxins from the head and neck region and helps cure headaches, migraine, sinusitis, chronic cold, chest congestions, cervical spondylitis and even facial palsy. One experiences a certain lightness of the body and head and this helps improve sleep. Ksheera dhoomam is a unique fomentation process using medicated cow’s milk which is heated and the resultant steam is aimed at the body or affected areas. This has proved to help effectively treat facial paralysis, neurological problems and speech disorders. As part of this intense Ayurvedic treatment, lukewarm herbal medicated oils are applied over the body by at least two to four masseurs in a rhythmic pattern, for a determined time duration of about 60-90 minutes a day for at least anywhere between 7-21 days. Pizhichil is majorly rejuvenating and is proven effective in patients suffering from arthritis, stiffness and pain in the joints and limbs, joints dislocation, rheumatic conditions and even certain paralytic conditions. The body is induced into a perspiring mode, by applying the boiled njavara rice pack . This is good to treat muscular dystrophy, skin problems, and improve muscle tone and skin texture. This is a specialized body purification procedure that is an inherent part of the Panchakarma therapy. The Vamanam process sets out to reduce the kapha dosha and thus helps reduce chest and lung congestions, reduce cold and cough etc. This is a rejuvenation therapy that concentrates on the neck and the head, by applying an herbal extract to the eye. The pack is safe as it consists only natural ingredients that can be administered into the eyes, it consists of honey and rosewater which helps remove foreign particles, dirt, and thus reduce any itchy, burning or watering sensation in the eyes. The Virechanam therapy is also part of the Panchakarma therapy. This involves an oral intake of purgative medicines to detox, cleanse, purge and purify the body and thus generate a balance between the doshas, vata, pitta and kapha. Bile, toxins and waste materials are purged from the body. This does enhance our strength, appetite and is a great rejuvenative therapy. As part of the Avagaham treatment, the body is anointed with medicated oil and the patient is given a plunge bath in a tub that is filled with herbs and herbal concoctions. It is said that this helps relieve back pain and also helps alleviate hip and spinal cord issues and relaxes us on the whole. In Urovasthi, specific, warm medicated oil is placed in a makeshift herbal paste bowl and is placed on the chest to treat respiratory issues, and chest complaints. This is preceded by a massage and this is a very stimulating and therapeutic treatment. With the Njavara Kizhi treatment, a paste or a pack of a special type of rice called njavara cooked in milk and then packed in tiny cloth bundles is used to massage the body. This is a total rejuvenation therapy that takes care of the skin, aches and pains, tiredness, stress and improves circulation and our overall sense of wellbeing. ‘Dhara’ is unique to Ayurveda. All ‘dhara’ based treatments emphasize on the use of medicated oils or liquids to be poured on to the body or head in a constant rhythmic manner, the time and period are determined individually. The vata dosha effects are reduced with this and rheumatic complaints and paralysis and other ailments does find relief in this treatment. 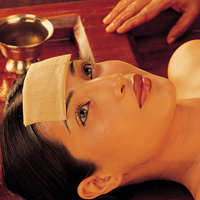 Vasti is an important aspect of the Panchakarma therapy and is in turn useful to relieve and treat many sicknesses. This is more like an enema but the application and purpose differs. Medicated oils, herbal formulations and preparations are used. This is used to help our digestive system like constipation, ulcers and other disorders, degenerative sicknesses, chronic back pains, arthritis, infertility and obesity. Typically after a massage therapy, the patient is subject to a medicated steam bath wherein some good herbs and leaves are boiled and the steam helps heal and also eliminate impurities once the patient undergoes a steam bath and also helps improve circulation. A special medicated powder is combined with medicated oil and applied on the head anywhere between 15 to 45-minute duration. This helps in alleviating certain ENT problems, sleeplessness, hypertension, migraines etc. The lepana treatment procedure entails applying medicated herbal pastes to the affected areas of the body. This is especially useful in treating inflammatory conditions where intense pain is experienced. The treatment helps reducing pain and the therapy is undertaken for a period between 7-14 days and from 90 minutes to 2 hours every day for 14 days. This is an anti-aging and rejuvenation therapy that aids in improving blood circulation, eliminates excess cellulite, improves muscle strength, renders a good face-lift to the skin, treats insomnia and promotes overall vitality and vigor. This is also a de-stressor and is also effective against chronic back pain, joint stiffness, sciatica, sprains and cramps. This is a specialized free-radical scavenger treatment. This is a rejuvenation therapy that aims at strengthening, increasing the Ojas within and help improve immunity. This is ideal for people who have suffered from paralysis, recovered from cancer treatment and also people who have had a bout of a viral or bacterial infection. The Padabhyanga treatment is a massage concentrated solely on the feet and legs and this helps bring an overall relaxation to the mind and body. Diseases like depression, blood pressure, insomnia and anxiety can be effectively addressed with this treatment. This is a gentle, relaxing massage directed only at the head, neck and shoulders. Shiroabhyanga definitely helps reduce fatigue, improve sleep and also reduces hair loss and delays premature hair graying. In the Janu Vasti form of treatment, the knee and feet are bathed in warm medicated oils and herbal pastes are applied so as to help alleviate knee and joint pains, and also promote circulation and strengthen joints. Herbal medicated oil is poured on to the back of the neck to help treat chronic pains and cervical spondylitis. This treatment is aimed at improving the overall digestive system and address problems that arises out of a bad food intake and lifestyles. The Chakra Vasti is applied to the umbilical region and thus helps improve digestion. As the name suggests, kesha means hair. This treatment with medicated oil is aimed at improving the quality of dull, lifeless hair and thus helps reduce graying and hair loss.